DeConcini McDonald Yetwin & Lacy, P.C. congratulates attorney Jody Corrales on her many accolades in 2015. Jody joined DMYL in January of 2015. During her foundational year with the firm, she was selected as a Rising Star® in the 2015 Southwest Super Lawyers® publication for the third time in a row. Jody was also selected by the Judges of the United States District Court in Arizona as a Lawyer Representative for the Ninth Circuit, serving a three-year term commencing October of 2015. In December, Jody was selected as a “40 under 40” Honoree. The “40 under 40” award is co-hosted by the Tucson Hispanic Chamber of Commerce and the Arizona Daily Star. The award recognizes young leaders who are making an impact in the community with their professional and charitable work. Jody focuses her practice on bankruptcy and creditors’ rights. She is Board Certified in Consumer Bankruptcy Law by the American Board of Certification, and is certified as a Bankruptcy Specialist by the Arizona Board of Legal specialization. Jody is also involved in the Tucson Chapter of the Federal Bar Association, and serves on its Board of Directors. She is also a member of the Arizona Bankruptcy American Inn of Court, an organization which helps foster the growth and development of younger members of the Bankruptcy Bar. In the past, Jody also served on the boards, and was Treasurer and Secretary for the Pima County Young Lawyers Division and the State Bar of Arizona’s Young Lawyers Division. 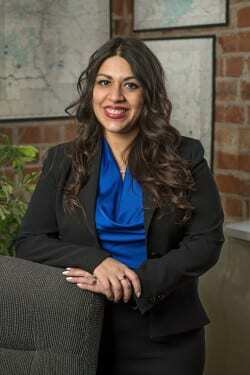 She is a 2006 graduate of the James E. Rogers College of Law at The University of Arizona.